Weymouth was awarded the 2018 Sunday Times/Peters Fraser + Dunlop Young Writer of the Year Award, in association with the University of Warwick, at a special ceremony at The London Library last night. He won the award for his debut, Kings of the Yukon, published by Particular Books. Andrew Holgate, judge and literary editor of The Sunday Times said: "It feels as if we have found, ready minted and hidden in plain sight, a really outstanding new contemporary British voice – one who literary editors (myself included; I plead guilty) almost completely failed to spot on publication." Also judging the prize were Kamila Shamsie and Susan Hill. Shamsie said: "Adam Weymouth is a wonderful travel writer, nature writer, adventure writer – along the way, he is also a nuanced examiner of some of the world’s most fraught and urgent questions about the interconnectedness of people and the natural world." Hill added: "I was knocked sideways by this book and quite unexpectedly. Adam Weymouth takes his place beside the great travel writers like Chatwin, Thubron, Leigh Fermor, in one bound. But like their books this is about so much more than just travel." Holgate added: "I’ve never seen such a strong and excited consensus among the judges for a winner. Weymouth combines acute political, personal and ecological understanding, with the most beautiful writing reminiscent of a young Robert Macfarlane. He more than holds his own among the award’s illustrious list of past winners, and I’m thrilled that the prize is able to give him some of the exposure he so clearly deserves. He is, I have no doubt, a significant voice for the future." To research the book Weymouth embarked on four-month voyage by canoe along the Yukon, which runs for 2,000 through Alaska. He beat a strong field to take the prize, with The Mermaid and Mrs Hancock by Imogen Hermes Gowar (Harvill Secker), The Reading Cure: How Books Restored My Appetite by Laura Freeman (Weidenfeld & Nicolson) and Elmet by Fiona Mozley (John Murray) also shortlisted. 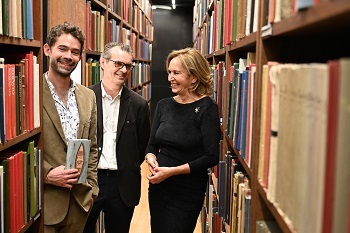 The £5,000 prize, which is for British writers under 35 producing fiction, poetry or non-fiction, has a good track record of identifying significant writers early in their career. Past winners include: Sally Rooney, Conversations with Friends (2017); Max Porter, Grief is the Thing with Feathers (2016); Naomi Alderman, Disobedience (2007), Robert Macfarlane, Mountains of the Mind: a History of a Fascination (2004); William Fiennes, The Snow Geese (2003); Zadie Smith, White Teeth (2001); Sarah Waters, Affinity (2000); Francis Spufford, I May Be Some Time: Ice and the English Imagination (1997); William Dalrymple, City of Djinns: A Year in Delhi (1994) and Simon Armitage, Kid (1993).